Sintoflex 41 - is an electrical insulating material consisting of PET film and a fullerboard. Sintoflex 141 - is an electrical insulating material consisting of a fullerboard laminating with PET film from both sides. 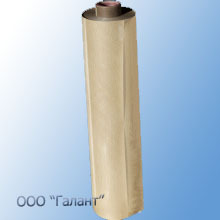 In a roll, Sintoflex is wound on a rigid bushing d=76 weighting approximately 30 kg. Sintoflex is used for the insulation of electrical machines and instruments’ windings in system insulation with E thermal resistance class suitable for normal usage.